Walks in the Berkeley hills seem to be generating quite a few research questions of the scientific sort. One of the highlights of walking in the Berkeley hills is the rock parks — such as Indian Rock Park and Great Stoneface Park — which are city parks that feature rock outcrops that are popular with climbers who want to practice their skills without the cost of going to a climbing gym, and with others who enjoy views across the Bay. I had already visited some of the rock parks in the past, but was surprised to find big rocks in other places in the Thousand Oaks area beyond the parks. Like right in people’s front yards. As luck would have it, a book about these rocks (which are called Northbrae rhyolite) is due out later this year. It is aptly called Berkeley Rocks. Needless to say, I am pretty excited to see the book, and you can expect a review here when it comes out. In the meantime, a little more about these rocks can be found in a San Francisco Chronicle article from last year, which notes the incorporation of the rocks with architecture of the surrounding houses. Apparently hundreds of homes in the area have rock in their yards. The Berkeley Path Wanderers route sheet for a walk of the rock parks also contains more details about area’s geology. Most of my reports so far about my walks discuss what I see in Berkeley, but I have not talked too much about what I hear while I am walking. On several of my recent walks in the Berkeley hills I have been thinking about the sounds of BART. For readers outside of the area, BART (Bay Area Rapid Transit), is the rail transit system that connects San Francisco and communities on the east side of the Bay. In some areas BART runs below the ground and in many other places it travels along an elevated railway. The three BART stations in Berkeley (Ashby, Berkeley, and North Berkeley) are underground. According the the BART history, quite a bit of controversy surrounded this decision, which cost time delays and money. I would eventually like to learn more about this decision to run the trains underground. I have no doubt that aesthetics played a big part in the choice, but what about the noise? On my walks, it is puzzling to me that the sounds of the BART trains seem louder up in the hills, far away from where the stations run through the flatlands of Berkeley. Why is this? My non-scientific guess is that it has something to do with the proximity of North Berkeley hills to BART where it comes above ground near the Berkeley-Albany border, and the way that sound travels through canyons and hills. Actual scientific explanations welcomed! Speaking of BART, these signs at North Berkeley BART make me happy that I walk to and from BART stations. I wonder how many people have missed their trains while trying to figure out exactly who can park here and when? General note about this series of entries: It is hard to know how many other every-street walkers are out there. I imagine there plenty who go about their walking quietly, without being noticed by the local news media or without documenting it for the general public online or in print. If you happen to know someone who has walked or is currently in the process of walking every street somewhere (a few are highlighted in my links on the right sidebar) please let me know. So far no one has come forward to say that they have (or know someone else) who has walked every street in Berkeley. I am still holding out hope; it would be fun to meet up with someone else to compare notes. However, I have received plenty of notes from people who do lots of walking in Berkeley, which is encouraging! San Francisco seemed like a likely place where someone would be walking every street, and in fact the “Walking Man” does just that. Tom Graham writes an occasional series for the San Francisco Chronicle on his walking adventures on the city’s 2,350 streets. Elsewhere in the San Francisco Bay Area, Dinesh and Joy Desai walked every street in the town of Los Altos back in 1985. Since then, Dinesh (sometimes with his wife and other friends) has embarked on a number of other walking and hiking adventures, including a 110-mile solo walk around the Salton Sea, a walk of the length of Death Valley National Park (during the summer), and a walks covering the entire California coast. If, like me, you are so tired of hearing the same old media stories about Los Angeles and its love of the automobile, you will be refreshed to find that someone is indeed Walking in L.A. You can see photos and maps of Neil Hopper’s walks in Los Angeles back to 2002. If you have spent much time in the San Francisco area you have no doubt encountered attitudes of superiority when the subject of SF vs. LA comes up. I suspect getting off of the freeways and onto to the streets on foot might erase some of those feelings. With architecture alone, there is so much to see: Hollywood bungalows, the Googie coffee shops and restaurants, the many interesting examples of modern architecture, and much more. Then there are the beach areas, the hip neighborhoods that have developed in places like Silverlake, Los Feliz, and Echo Park, hills and parks, and the landmarks that most people drive by in a car. If you are interested in walking in Los Angeles, Hopper’s site and the book Walking L.A., by Erin Manohey, look like good places to start. I have not heard of anyone walking every street in Sacramento, but a Davis resident in his late 70s has walked every street there and now helps with a healthy walking program in town. Otherwise I have not heard of walkers in other cities in California, but I imagine they are out there! Sometimes people who have grown up in other parts of the country with more distinct seasonal changes comment “I love California, but I wish there were real seasons here.” Having lived my entire life so far in California so far, I admit to not being able to relate to those feelings. On walks, I really appreciate seeing some green along the way at all times of the year. Throughout the spring, summer, and fall, many varieties of fruit are visible on the trees that have been planted in yards and along the parking strips. So far I have seen apples, pears, apricots, peaches, plums, cherries, figs, avocados, loquats, pineapple guavas, persimmons, pomegranates, as well as olives and nuts. During the winter months the lemons are abundant, though other citrus does not seem to fair as well here as warmer parts of the Bay area. I have also spotted grape and kiwi vines, and all sorts of berries. Some time ago I heard a rumor about a fruiting banana tree growing somewhere in Berkeley, but I have yet to see one. In Los Angeles (where you can really grow bananas and other tropical fruit), Fallen Fruit has been mapping the location of public fruit trees. I love this project idea, and have toyed with the idea in the past of mapping fruit trees in Berkeley. It would be a great educational project for adults and children to learn more about the origins of our food, and might also encourage more people to plant fruit trees in their own yards. It would have to be executed in such a way, though, as to not encourage people to trespass, disturb residents, or strip street trees of their fruit. In addition to fruit street trees (i.e., trees planted in the area between the sidewalk and the road), I have seen fruit trees in some of the parks in Berkeley, such as Ohlone Park and People’s Park. Unfortunately a number that I have seen are fairly overgrown and would require a ladder for picking, but a few are a reasonable size and shape. At the new location of the Berkeley Adult School at Virginia and Curtis streets, Schoolhouse Creek Commons features many young fruit trees. One of the reasons why cities sometimes do not encourage the planting of street trees is the mess they can create. No one appreciates walking through a slimy mess of smashed plums or cherries, and the slippery fruit could be dangerous for someone in a wheelchair or unsteady on their feet. Sometimes trees are planted with the best of intentions, but then the original owner moves away or is not physically able to pick the fruit any longer. 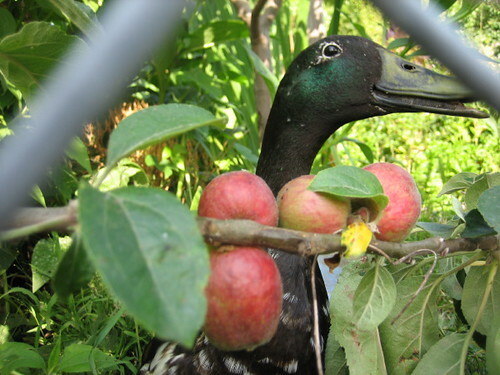 Village Harvest, an organization that has been successfully harvesting fruit from home fruit trees in the Santa Clara Valley, expanded last year to working with the Berkeley organization Spiral Gardens to collect fruit from trees in Berkeley. The fruit is donated to local food banks and hunger programs. This weekend’s walking took me up to some of the streets and paths of the Berkeley hills. As I have mentioned before, I have been using the Berkeley Path Wanderers map as a guide to include all of the passable paths in my walks. I have been wondering about other cities that have lots of paths and stairways. San Francisco has lots of them, and so do Los Angeles, and Portland,OR. What other cities have them? If you know, please post a comment! The stairway pictured here is in John Hinkel Park. My first visit to this park was during the winter, when it had been raining quite a bit. The water was flowing through the creeks and everything was very green. It was still quite nice on this summer visit. It includes an outdoor ampitheatre, a clubhouse that is in need of restoration, and some nice picnic and play areas. My favorite part of this park, though, is the nicely designed stairs and paths that allow you to meander through the park. Why did you decide to walk every street and pathway in Berkeley? Why not just walk some of the streets? It may seem like a slightly obsessive-compulsive activity to some, but I feel that walking every street of Berkeley will give me a good sense of the city. Often we take the same routes around the places we live and miss out entirely on interesting things. Most of us, myself included, have exclaimed at some point, “Oh, I have lived here for years and I had no idea such and such existed.” I love the excitement of walking down a new street. Berkeley has around 230 miles of paved streets, all of which I plan to walk. Additionally I will be walking the passable pathways (about 100 out of the 136 in Berkeley), which range from stairs to paved and dirt paths. This will add several more miles. Of course, the amount of mileage will be much greater because I will retrace streets to get to other streets, walk back from dead-end streets, etc. Do you hope to prove anything about Berkeley by the end of this walk? Many people associate Berkeley with certain ideas — hippies, People’s Park, the Free Speech Movement, Chez Panisse and the Gourmet Ghetto, radical politics, historic preservation, for example. I have encountered a range of reactions when I say I live in Berkeley, from the “Berzerkeley” and “People’s Republic of Berkeley” comments, to nostalgia for an era that has passed, to feelings of either dislike or love for the city. I hope to walk with an open mind, and observe everything and report what I find throughout Berkeley. Is this a political blog? No, not really. I do not have a political agenda I am trying to push, and I plan to report on a wide range of things that I observe on my walks. Often I will include the questions I have asked myself on a particular walk or provide background or further research on a topic, but the focus of this blog is not Berkeley politics. Why Berkeley and not San Francisco? San Francisco is a beautiful and interesting place to walk. I have lived in San Francisco in the past and still visit often (a trip from Berkeley to San Francisco on BART takes about 20-40 minutes depending on which stations you are travelling to and from). I have done lots of walking there, and plan to continue doing so. But I want to get to know the city where I live, and I would like provide some ideas for others who are interested in exploring Berkeley. Do you walk alone or with others? May I come on a walk? I do quite a bit of the walking on my own, but I am also sometimes accompanied by my partner, Joe, who is a photographer. Some of his photos of Berkeley appear in this blog along with mine. I welcome the company of others on my walks, although I have jokingly warned some people that these are far from guided tours. I am also happy to receive suggestions and feedback about the background and history of specific places in Berkeley. What will you do after you finish walking every street in Berkeley? Currently I have quite a backlog of discoveries and topics to write about, so I imagine I will be writing about them for awhile after the completion of the entire walk. I will continue to take walks in Berkeley, and revisit favorite spots. I hope to put together some thematic walks to feature here on the blog and perhaps in printed form, and to collaborate with Hidden Gems of Berkeley, a map and bike tour of interesting spots in Berkeley. Finally, I plan to walk the streets of neighboring communities that are easily accessible either on foot or by transit, such as Albany, Kensington, Emeryville, and Oakland. I would like to walk every street in my city or town, but it is too big/boring/dangerous/etc. Berkeley happens to be a fairly good-sized town for every-street walking — not to small or big, and with a mix of hills and flatlands. Depending on where you live, you could walk your immediate neighborhood, or a part of town that you like, or focus on walks that center around something that interests you, such as architecture or gardens or parks. You could also walk in the neighborhood where you work or go to school, or take a subway or train or ferry or bicycle to a neighborhood that you have always wanted to explore. For some more ideas, please visit some the websites of other walkers I have linked to on the right sidebar of this blog. If you have other questions, please feel free to ask! San Francisco, being a popular tourist destination, has inspired all sorts of guidebooks. Most of them cover at least some of the popular landmarks such as the Golden Gate Bridge, Coit Tower, and the Transamerica Pyramid. Kate Pocrass’ book Mundane Journeys does not mention any of these places. This tiny book of tours (which all start with “Walk, bike, or public transit to…”) suggests ways to look beyond the obvious and find interesting details in ordinary places. On a trip to the popular tourist area of North Beach, for example, you will play hopscotch on a playground and look at dot patterns on a sidewalk. In other locations, you will look at garage doors, apartment buildings, sidewalk patterns, window displays, and more. These ideas can be applied wherever you are walking, and can inspire thought and questions. 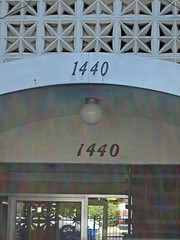 In the photo posted here, for example, the building number appears three times on the front of this Berkeley apartment building (at this size it is hard to tell, but the number is also on the glass front door). This amused me greatly, and I wondered why three times and in what order and under what circumstances was each set of numbers installed on the building. The other emphasis of Mundane Journeys is interacting with people in shops and businesses. Some of the stops on her journeys having you entering small businesses and asking questions or considering getting something interesting to eat or drink (such as a Cuban soft drink or coconut mochi). I find this more difficult to do. Often I will say hello to people in residential neighborhoods who are pruning their roses or weeding their gardens, but I have hesitated to walk into many of the businesses. Recently, though, I was walking on Telegraph Ave., and had two nice interactions with business owners. I used to avoid this, thinking I was bothering people unnecessarily, but there is a difference between wasting someone’s time and being genuinely interested in their small business. Even if I am not there to purchase an item or service now, I will remember it in the future or recommend it to someone else who needs the service. Also, many people who have small businesses (especially those offerering a service) just seem to enjoy talking with other people. It is unrealistic to think that one could have the same experience in a large urban area as in a small town, but there is often still the opportunity to create some connection with the people who live and work there.